Spring 2000 – Hottest On Record in U. S.
Yellow to orange colors of warm temperatures over two-thirds the United States in May 2000. Data from the June 16, 2000 National Climatic Data Center report, a division in the U. S. National Oceanic and Atmospheric Administration (NOAA). 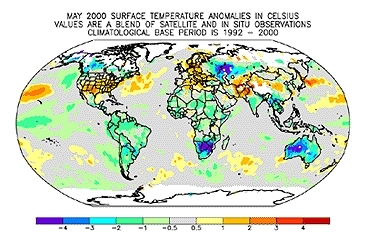 Temperature graphic courtesy NOAA.